Rain, wind, and surf? Or out-to-sea? As Major Hurricane Matthew parallels the U.S. East Coast late this week, impacts look increasingly likely for New Jersey. I'm happy to report that we'll enjoy some beautiful early October weather, while Matthew makes up its mind whether to hit the Northeast U.S. Clouds will thin Tuesday across most of New Jersey. As this weekend's storm system continues to depart, it will continue a northeasterly (on-shore) wind. So I suspect clouds will be a bit more stubborn along the oceanfront through Tuesday afternoon. A few showers and sprinkles can't be ruled out along the eastern edge of NJ too. Tuesday night should be quite, as temperatures fall into the mid 50s under partly cloudy skies. Skies should clear to sunshine for Wednesday and Thursday with pleasant, seasonable temperatures. Afternoon highs should end up in the lower to mid 70s. Hurricane Matthew is still a powerful category 4 major hurricane, and will continue slamming through Haiti, the Dominican Republic, Jamaica, and Cuba on Tuesday. Brace yourself for some truly devastating damage photos there, spawned by over a foot of rain and 145+ mph winds. Matthew will next aim for the Bahamas on Wednesday, while making a subtle turn to the northwest. What's northwest of the Bahamas? The United States, of course. --Since Monday, forecast model consensus has tightened up on a solution that keeps Matthew perilously close to the U.S. East Coast. That's bad news not just for New Jersey, but for residents from Florida to Maine. --Having said that, it's not time to panic or make a run on the stores - this remains a highly uncertain forecast. --I don't think there's much doubt that the Southeast United States - from Florida to the Carolinas - will feel the touch of Matthew later this week. Keep in mind, the hurricane is expected to maintain hurricane strength through at least part of the weekend. 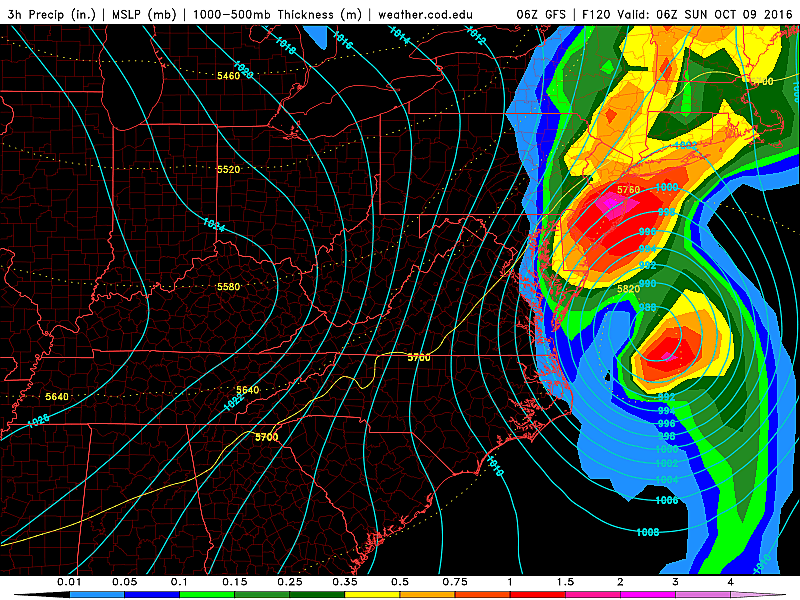 So the SE coast could get smacked pretty hard. 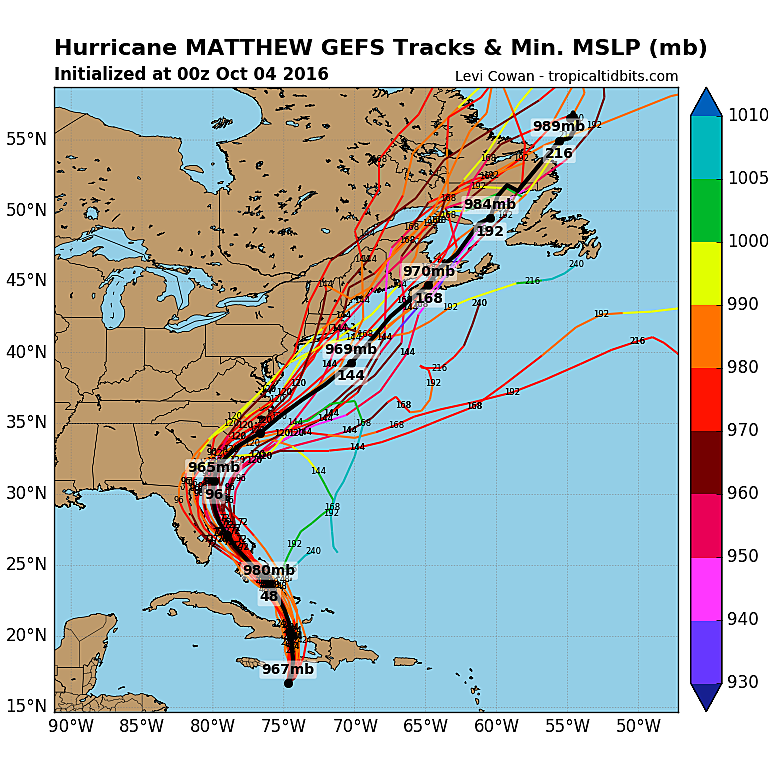 --As for the Northeast United States - including New Jersey - there remains a wide variety of possibilities for Matthew's track. The closer the storm hugs the coast, the stronger the effects we will feel in the Garden State. --Timing is still questionable too. If Matthew threatens New Jersey, impacts could begin as early as Saturday and last as long as Monday. --Worst Case Scenario: The GFS forecast model continues to paint a very serious picture for New Jersey, putting the center of the storm very close to the Jersey Shore late Saturday through Sunday. Rough estimates: 7+ inches of rain and 80+ mph, with major storm surge along the coast. It's not hyperbole - it's the realistic worst case scenario. --Best Case Scenario: There's still hope that Matthew will miss New Jersey - but that hope is now becoming more unlikely. I've been leaning heavily on the GFS ensemble forecast so far for Matthew, but I'm a bit dismayed at the latest output. The GEFS spaghetti plot has become helter-skelter, with a huge spread of solutions ranging from a direct hit to an out-to-sea path. In addition, the ECMWF (European) model and its associated ensemble run shows an out-to-sea solution once Matthew passes the Carolinas. --Keep in mind when looking at all these forecast plots and pretty pictures: Matthew is not just a dot. It is a large and incredibly strong hurricane. Even if the out-to-sea forecast verifies, clouds, rain, and wind may still reach the southern coast of New Jersey. --So when will we know more? 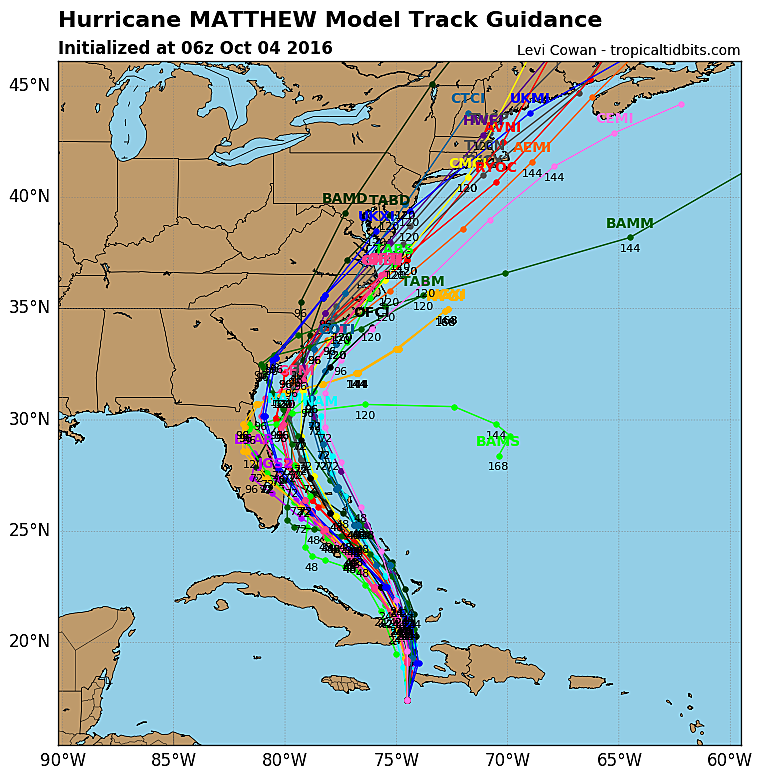 Every successive model run (every 6 to 12 hours), we get more information and more details to fill in more of the Matthew forecast puzzle. I believe we'll get a substantially clearer view of the synoptic situation and Matthew's track once it's at least halfway through the Bahamas. So, by late Wednesday into early Thursday, if there are alarm bells to sound for New Jersey, they'll be ringing. If there's anything new to report Monday afternoon, we'll push out a special web update. Otherwise, our next comprehensive forecast blog is scheduled to be posted by 7 a.m. Wednesday.